We are the Authorised dealer of the Brady and Morris chain pulley block. We are the supplier and exporter of the RS Chain Pulley Block. there are other two types of the Morris chain pulley block. NX model and EX-model chain pulley block. 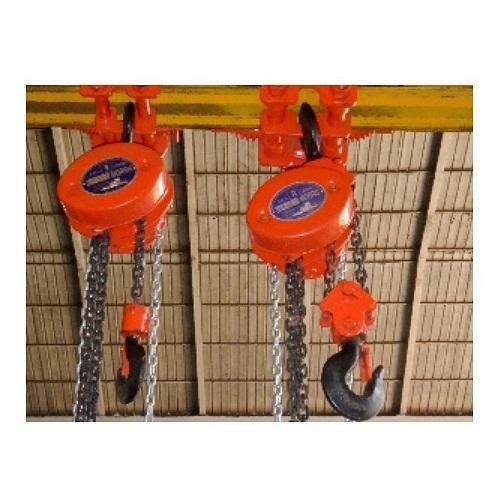 the RS model chain pulley block in capacities ranging from 1 ton to 50 ton.However, these Blocks can be completely customized as per the client's requirement and can also be made in a short-headroom model. With our commencement in 2000, we, Sumo Material Handling Systems & Services, have emerged as precursor in manufacturing and supplying divergent spectrum of Material Handling Equipment. We have gained ISO 9001:2008 certification by providing premium quality EOT Cranes, Single Girder EOT Cranes and Double Girder EOT Cranes. Our offered products are well reckoned for high sturdiness, structural stability, corrosion resistant and user friendly attributes due to their fabrication being done from ultramodern technology. Apart from this, we have garnered ourselves extensive customer base by providing highly valuable and authentic installation services at competitive market rates. In order to materialize segregated demands of our customers, we have carved in leading edge infrastructure system which includes advanced manufacturing, quality inspecting and warehousing facility. With the aid of our manufacturing unit, we are able to fabricate wide assortment of products with maximum precision as per clients' laid requirements. In addition to this, we make defect proof delivery of products by putting effective use of quality testing and spacious warehousing facility for durable packaging. With these prospects, we have garnered prestigious clients such as Crompton Greaves Ltd, Anup Engineering Ltd and Indian Oil Corporation, Panipat.